Let’s talk about SharePoint 2016 newly release deployment details. We will start with Hardware requirements, we can see that SharePoint 2016 would require something between 8 to 16 GB of RAM but for 1st time ever Microsoft has suggested a secondary drive on all SharePoint and SQL servers. Suggested minimum number of processor is 4 cores which mean we will have minimum I5 on all servers. List of Unsupported Deployment Scenarios make a big difference for SharePoint 2016. Workgroup, Client OS (Windows 7, Vista, etc), Dynamic Memory and Windows Web Server would be unsupported. So you would need a Domain environment with windows server and Static RAM on all servers. This will increase license cost and hardware cost because an additional AD server and memory would be required. So far Windows server 2012 R2 and Technical preview are supported OS. Although .net framework 4.6 is released, you would need minimum .net framework 4.5.2 to install SharePoint server 2016. You would need SQL server 2014 to install SharePoint 2016 in your environment. I don’t know why we still use AppFabric when we know it will be discounted soon in 2016. As you can see “Microsoft Information Protection and Control Client” is the only new Prerequisite and it will be used for compliance on SharePoint server. We can see the same on Central Admin screen. Now comes the most interesting part of SharePoint 2016 which is MinRole. During MVP summit 2014 we were told about Minrole and its database. Had a big conversation on same because it may have complexity with upgrade but here I see that Minrole is implemented in SharePoint 2016. Now the services will be divided in 3 sections viz User services, Robot services and caching services. 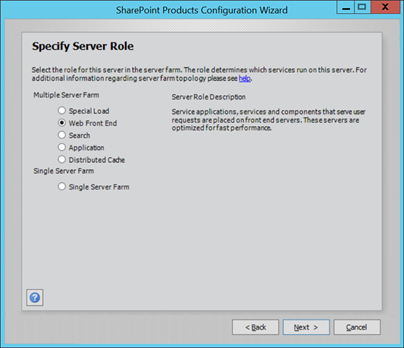 Now when you install SharePoint 2016, you would get option to select role you wish to enable on the SharePoint server. Previously we had Single Server or Application and WFE role but now we have 6 different roles available with us viz SpecialLoad, WebFrontEnd, SingleServerFarm, Search, Application, DistributedCache. Here is the secret of these roles, predefined server role is configured and optimized for its intended purpose provisioning the expected services designed to support its function within a server farm environment. So you don’t have to worry about which server should run which services. You can configure SharePoint 2016 using psconfig GUI or powershell. As far as I know stsadm command are now deprecated and cannot be used in SharePoint 2016 for management or configuration purpose. Here is a GUI interface of a SharePoint 2016 psconfig wizard. Another advantage of these MinRole is related to Server Health rules. If you have selected SharePoint search role and health rule detects any other service running on the server, it will give you an alert for same. Now this is what I say a new feature in SharePoint 2016. Now comes the biggest pain with SharePoint 2016. You cannot perform a SharePoint 2016 inplace upgrade. This means you will have to create\reconfigure your Service application and use attach detach method to complete your upgrade. Another problem is we need upgrade to SharePoint 2013 and then we can upgrade to SharePoint 2016. A direct upgrade from older version of SharePoint is not available in SharePoint server 2016.